What is the Earnings per Share (EPS) Formula? EPS is a financial ratioFinancial RatiosFinancial ratios are created with the use of numerical values taken from financial statements to gain meaningful information about a company. The numbers found on a company’s financial statements – balance sheet, income statement, and cash flow statement are used to perform quantitative analysis and assess a company's liquidity, leverage, growth, which divides net earningsNet IncomeNet Income is a key line item, not only in the income statement, but in all three core financial statements. While it is arrived at through the income statement, the net profit is also used in both the balance sheet and the cash flow statement. available to common shareholders by the average outstanding sharesWeighted Average Shares OutstandingWeighted average shares outstanding refers to the number of shares of a company calculated after adjusting for changes in the share capital over a reporting period. The number of weighted average shares outstanding is used in calculating metrics such as Earnings per Share (EPS) on a company's financial statements over a certain period of time. The EPS formula indicates a company’s ability to produce net profits for common shareholders. This guide breaks down the Earnings per Share formula in detail. A single EPS value for one company is somewhat arbitrary. The number is more valuable when analyzed against other companies in the industry, and when compared to the company’s share price (the P/E RatioPrice Earnings RatioThe Price Earnings Ratio (P/E Ratio) is the relationship between a company’s stock price and earnings per share. It gives investors a better sense of the value of a company. The P/E shows the expectations of the market and is the price you must pay per unit of current (or future) earnings). Between two companies in the same industry with the same number of shares outstanding, higher EPS indicates better profitability. EPS is typically used in conjunction with a company’s share price to determine whether it is relatively “cheap” (low P/E ratio) or “expensive” (high P/E ratio). The first formula uses total outstanding shares to calculate EPS, but in practice, analysts may use the weighted average shares outstandingWeighted Average Shares OutstandingWeighted average shares outstanding refers to the number of shares of a company calculated after adjusting for changes in the share capital over a reporting period. The number of weighted average shares outstanding is used in calculating metrics such as Earnings per Share (EPS) on a company's financial statements when calculating the denominator. Since outstanding shares can change over time, analysts often use last period shares outstanding. There is also often talk of diluted EPS in financial reports. Diluted EPSValuationFree valuation guides to learn the most important concepts at your own pace. These articles will teach you business valuation best practices and how to value a company using comparable company analysis, discounted cash flow (DCF) modeling, and precedent transactions, as used in investment banking, equity research, includes options, convertible securities, and warrants outstanding that can affect total shares outstanding when exercised. Another type of earnings per share formula is adjusted EPSNormalized EPSNormalized EPS refers to adjustments made to the income statement to reflect the up and down cycles of the economy. The adjustments include removing. This removes all non-core profits and losses, as well as those in minority interests. The focus of this calculation is to see only profitProfitProfit is the value that remains after a company’s expenses have been paid and can be found on an income statement. Other terms include income and earnings or loss generated from core operations on a normalized basis. ABC Ltd has a net income of $1 million in the third quarter. The company announces dividends of $250,000. Total shares issued for the period was 12,000,000, with total shares outstanding at 11,000,000. Since every share receives an equal slice of the pie of net income, they would each receive $0.068. Download CFI’s free earnings per share formula template to fill in your own numbers and calculate the EPS formula on your own. 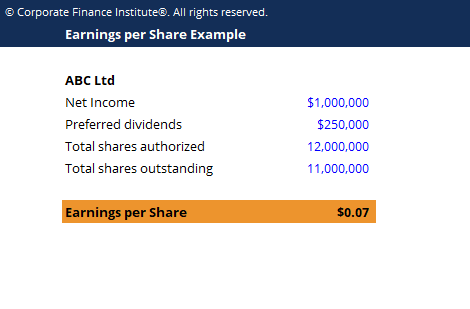 As you can see in the Excel screenshot below, if ABC Ltd has net income of $1 million, dividends of $0.25 million and shares outstanding of 11 million, the earnings per share formula is ($1 – $0.25) / 11 = $0.07. Note that many companies do not have preferred shares, and for those companies, there are no preferred dividends that need to be deducted. The reason preferred dividends are deducted is that EPS represents only the earnings available to common shareholders, and preferred dividends need to be paid out before common shareholders receive anything. Watch this short video to quickly understand the main concepts covered in this guide, including what Earnings Per Share is, the formula for EPS, and an example of EPS calculation. Earnings per share are almost always analyzed relative to a company’s share price. This ratio is known as the Price to Earnings ratio (or P/E ratio). 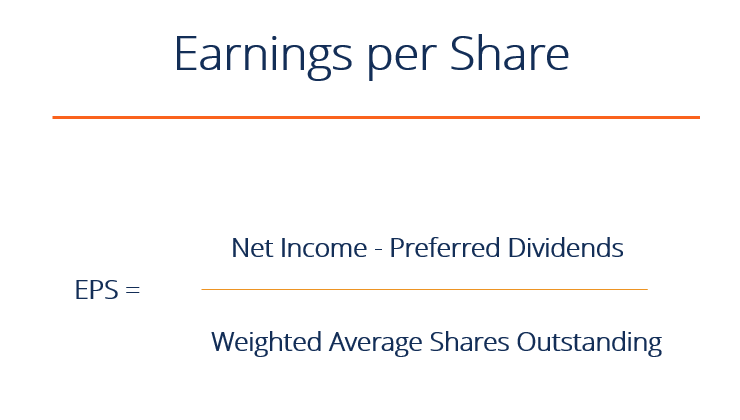 Learn more in CFI’s guide to the Price-Earnings RatioPrice Earnings RatioThe Price Earnings Ratio (P/E Ratio) is the relationship between a company’s stock price and earnings per share. It gives investors a better sense of the value of a company. The P/E shows the expectations of the market and is the price you must pay per unit of current (or future) earnings. Cash EPSCash Earnings Per ShareCash earnings per share (cash EPS) is the operating cash flow generated by a company divided by the number of shares outstanding. Cash earnings per share (Cash EPS) is different from traditional earnings per share (EPS), which takes the company’s net income and divides it by the number of shares outstanding.